Maika Halfwolf has entered the lair of the enemy, choosing to venture inside the wall that keeps two formerly warring cultures separate and brave a city where her people are used as slaves and for experimentation. Is what she’s after worth the risk? This triple sized first issue is a strong introduction to Maika and her world. The comic doesn’t shy away from uncomfortable topics or depictions, and is blunt in its approach to horrific actions and attitudes from the very start. The nonchalant way certain things are discussed immediately establishes the uncomfortable status quo and the moral depravity of the Cumaea, a ruling coven of sorts experimenting on Maika’s race, the Arcanic. Their obviously just scratching the surface here, but there’s already nice themes of class warfare, racial tensions, and the prices of power building. The art is excellent and highly detailed, nicely bringing Liu’s vision to life. The comic has a steampunk aesthetic but the world is just as infused with magical and spiritual elements as technological ones. It’s a fascinating mix so far. 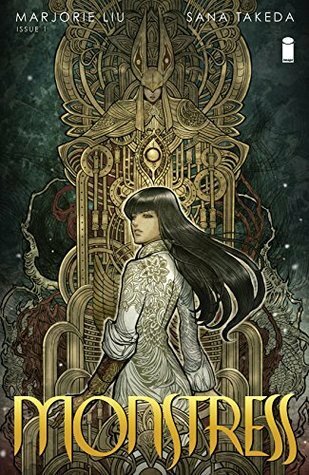 Monstress is off to a powerful start with a gritty presentation, an intriguing background world, and a compelling main character. Will be interesting to see how the story grows from here.